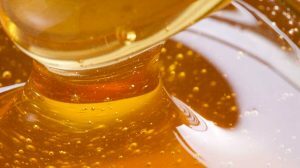 Pour 3 cups of honey into a small pot and heat it until boiling. Stir occasionally. Once boiling, the honey will really start to bubble. Keep stirring. Using a candy thermometer to gauge the temperature, continue to boil the syrup until it reaches the “soft ball” stage (235-240 degrees Fahrenheit). If you pass the soft ball stage, don’t worry. Your candy will just be more crunchy than chewy. At this stage you can also stir in optional flavors. For example add a 1⁄2 cup of fresh squeezed orange juice plus the zest of one orange or add 2 tsp of ground cinnamon. Remove the pot from the heat. Pour your honey syrup in lines on the snow or shaved ice. BE CAREFUL. The honey is VERY hot. Press a craft/popsicle stick into one end of the the honey line, and then as the honey is cooling, roll it up around the stick. Recipe courtesy of Chef Gregory Hansen and used in EATS after school cooking class in December 2015.